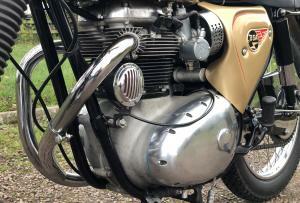 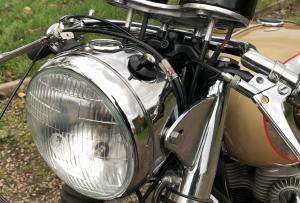 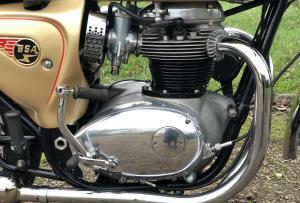 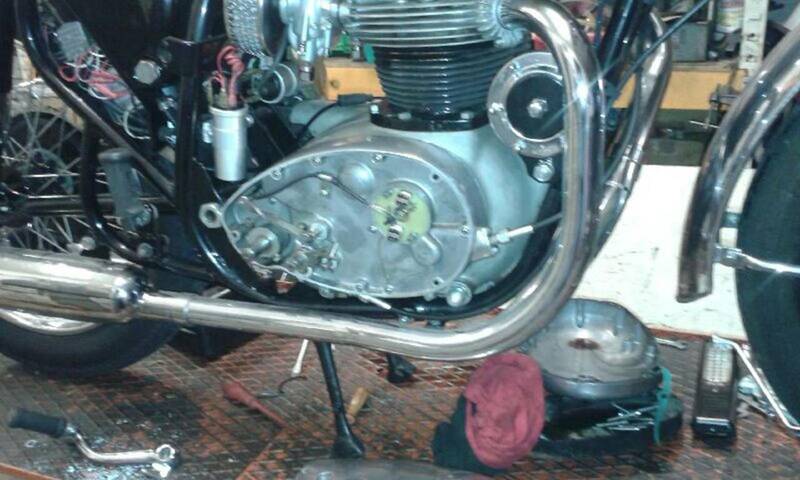 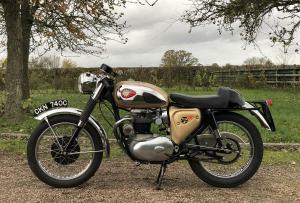 1965 BSA A65 Lightning Clubman 650cc. 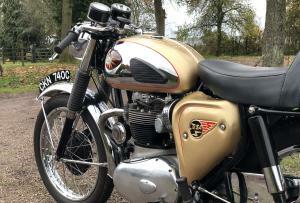 The VMCC have confirmed that It was despatched from the factory on the 22nd of October 1964 as a Gold lightning. 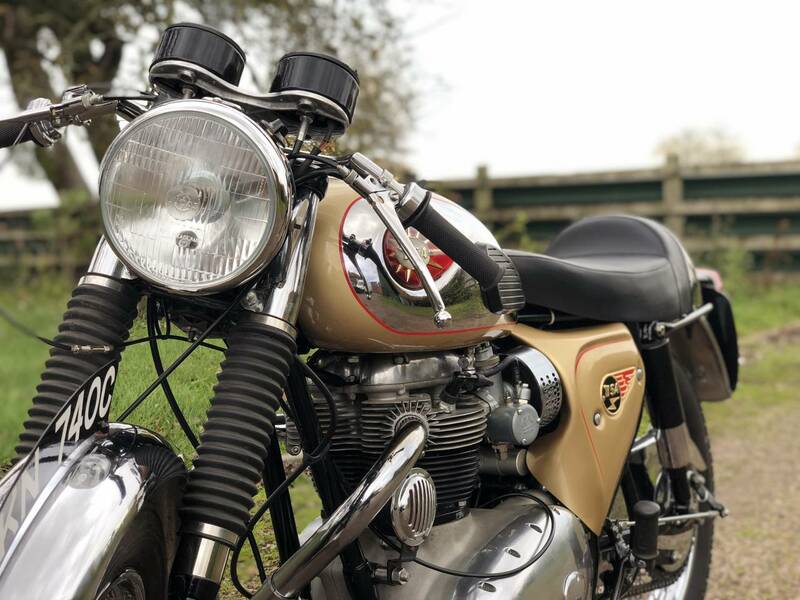 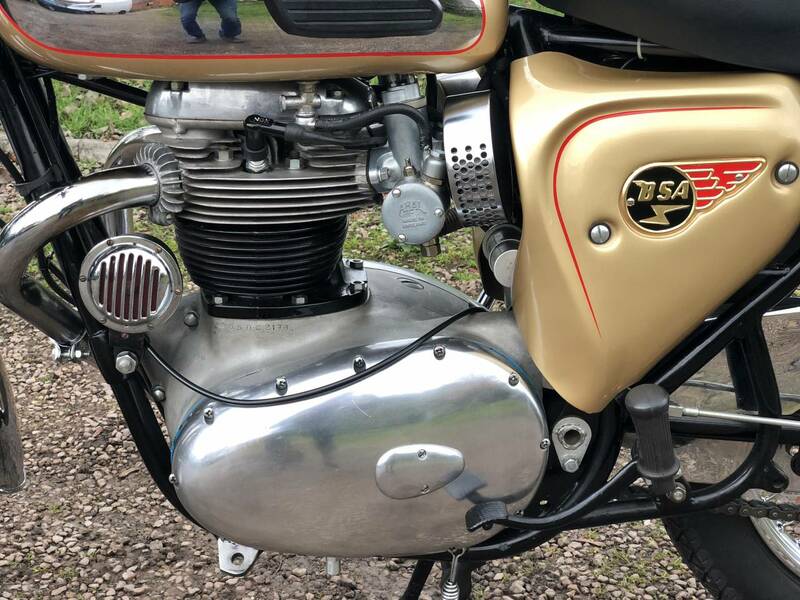 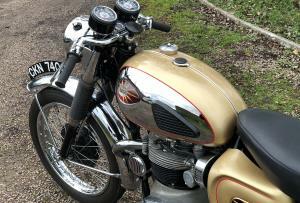 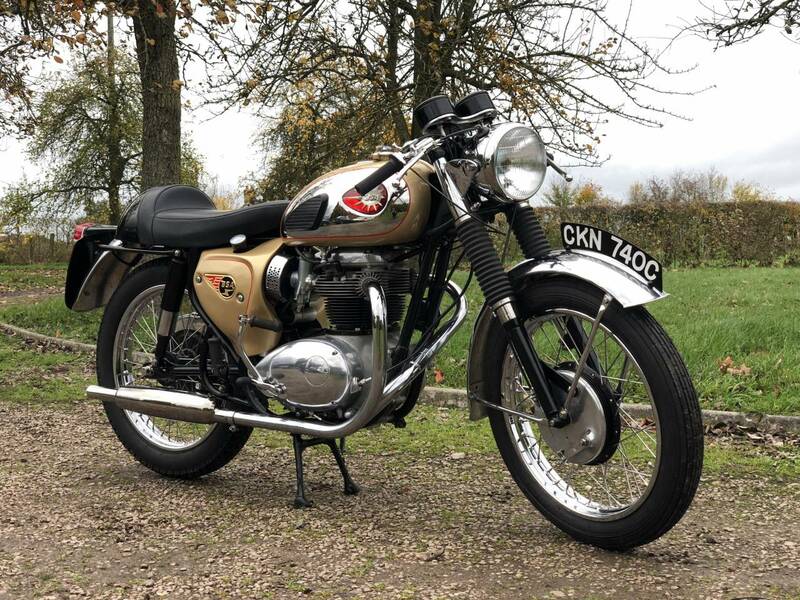 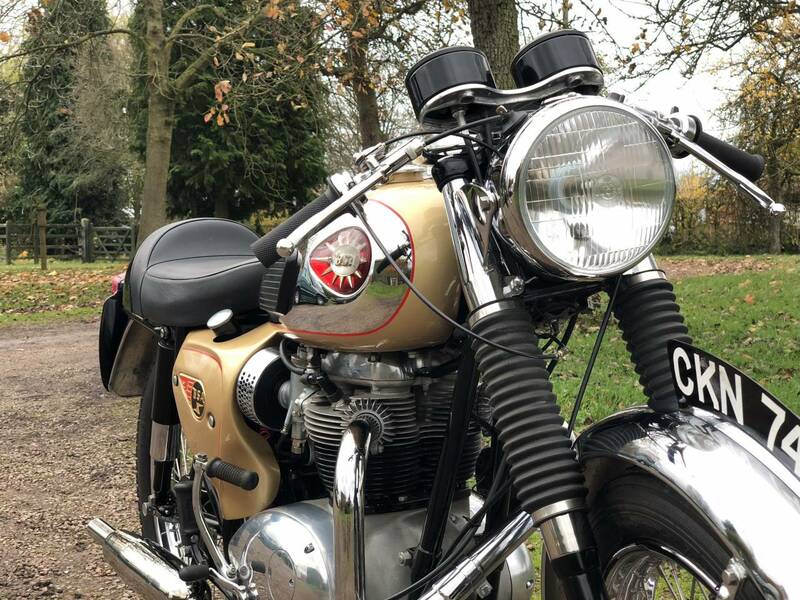 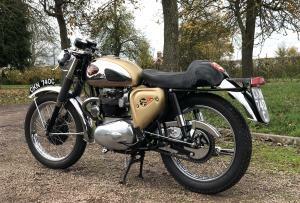 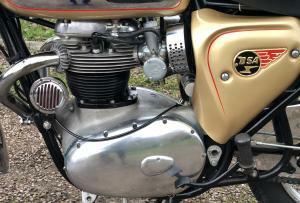 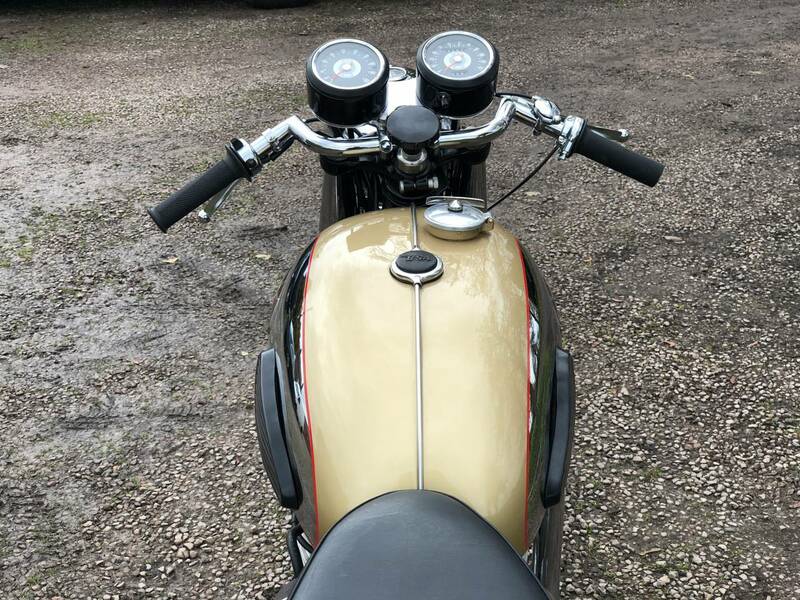 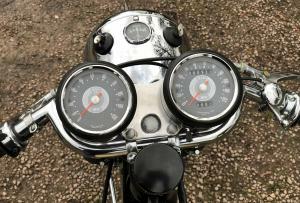 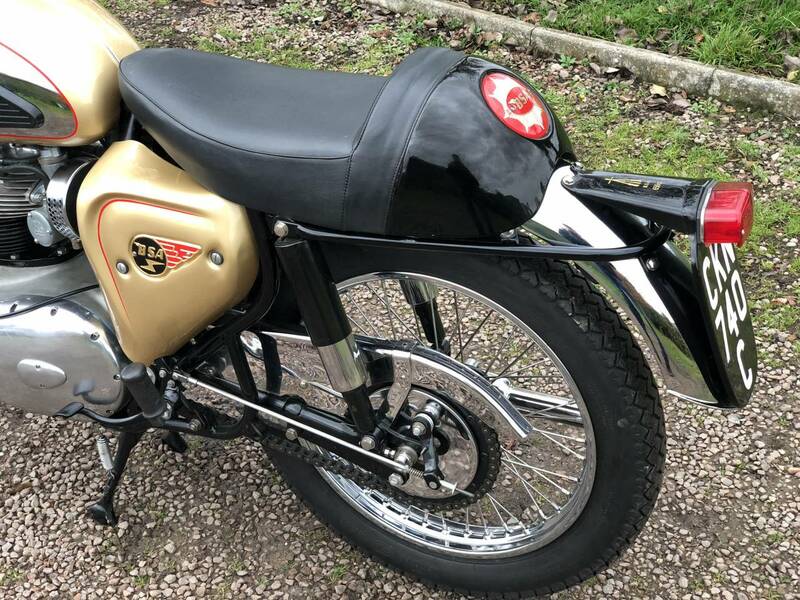 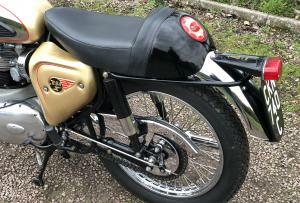 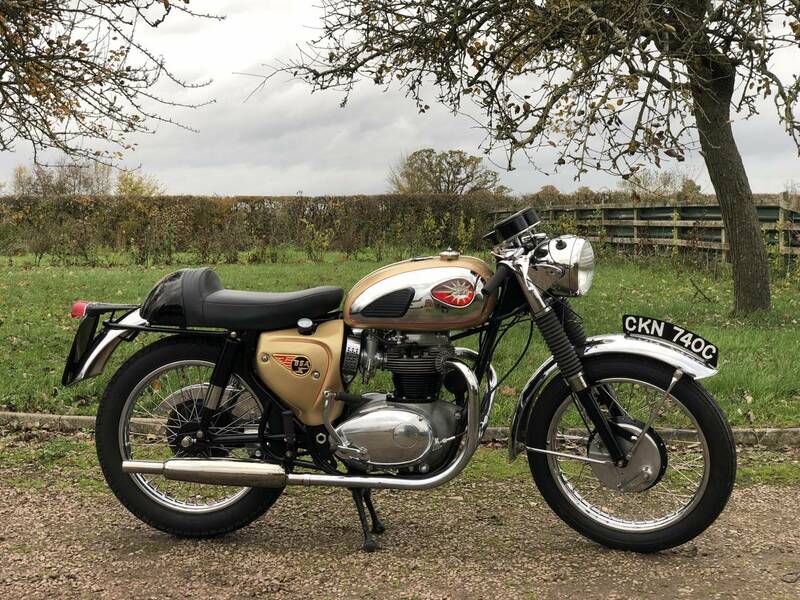 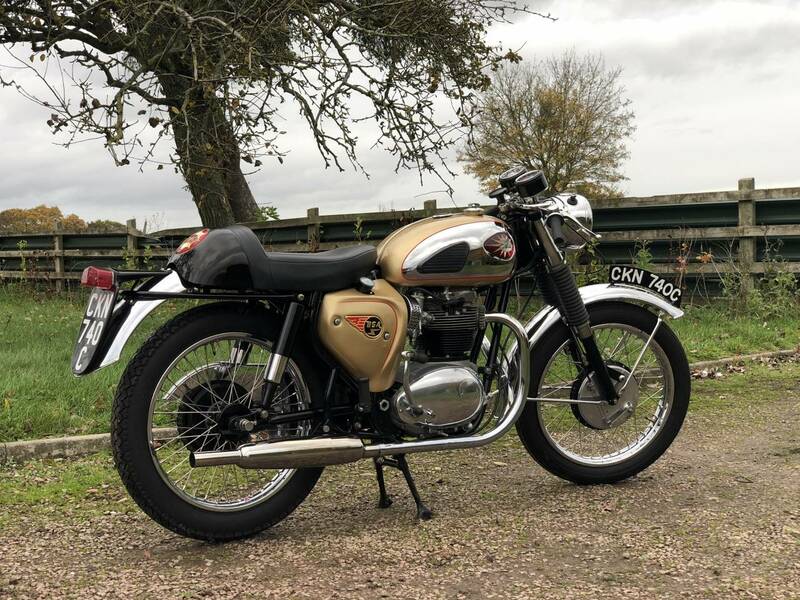 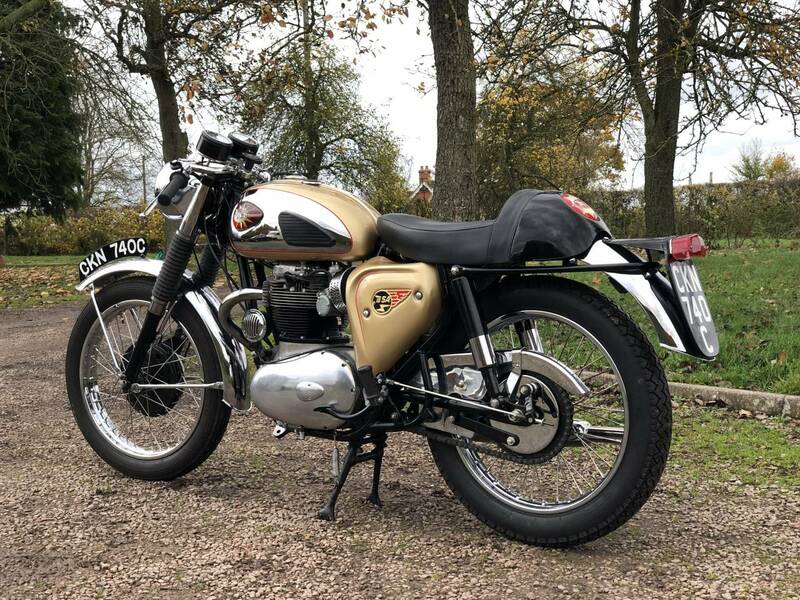 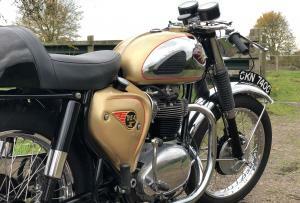 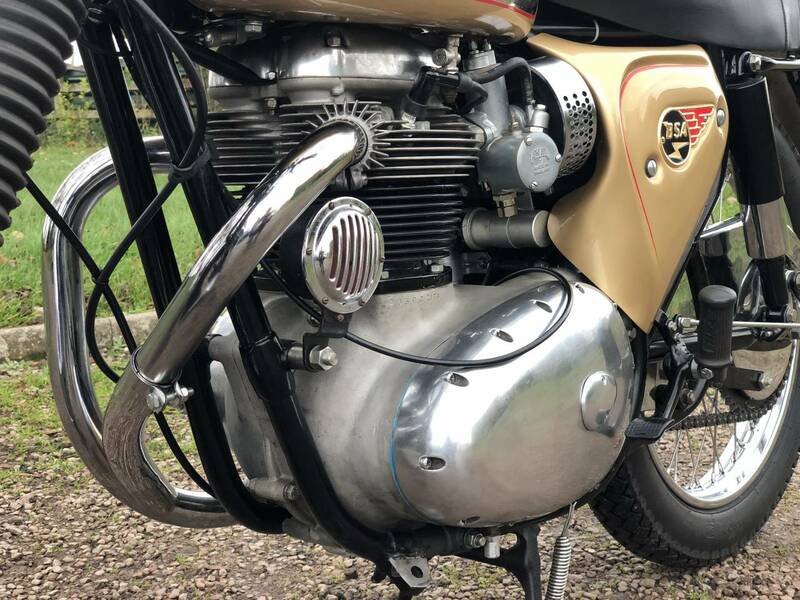 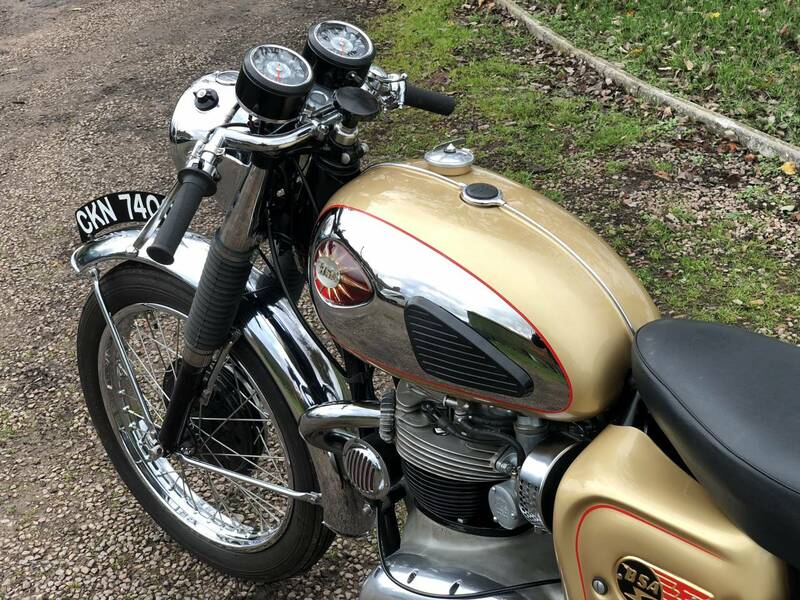 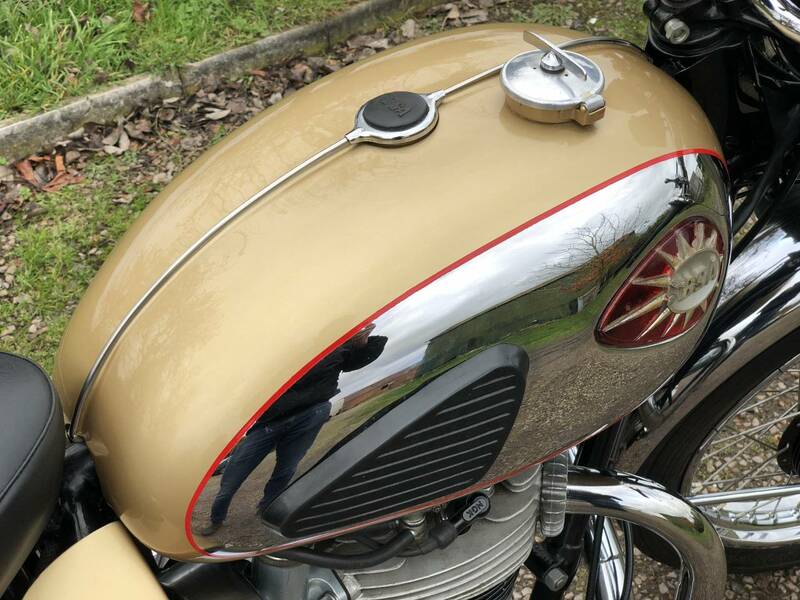 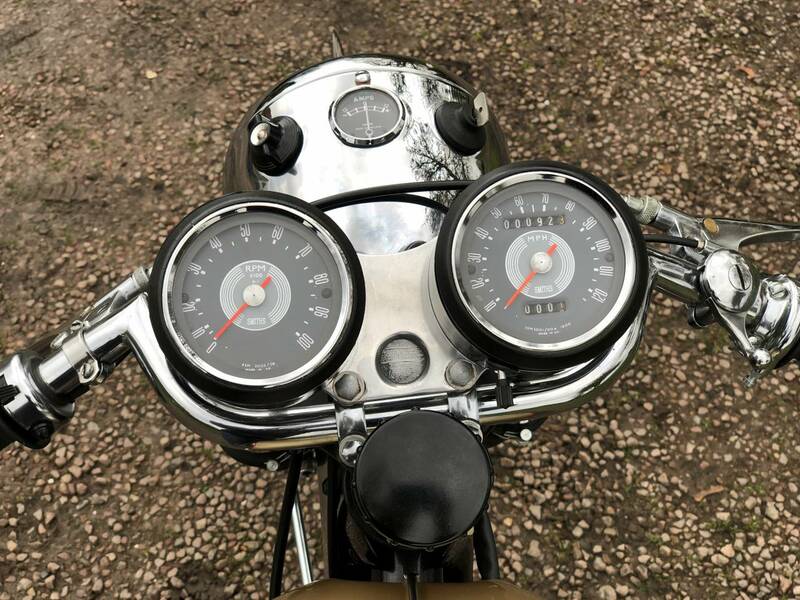 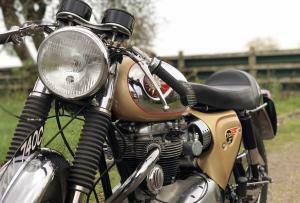 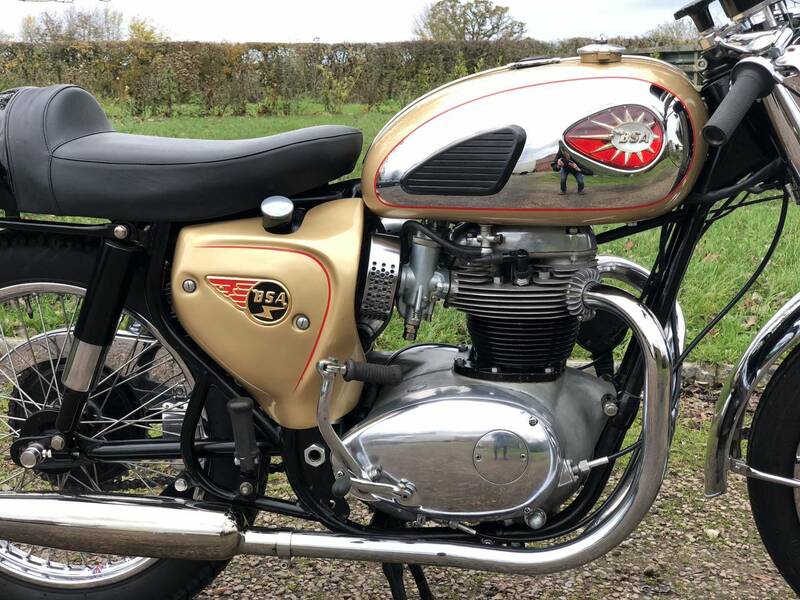 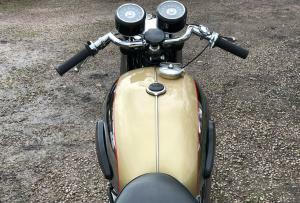 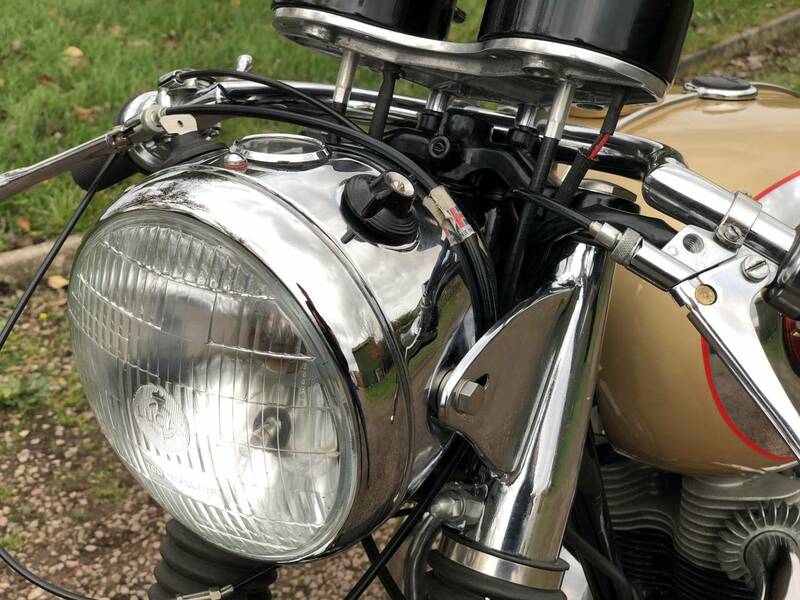 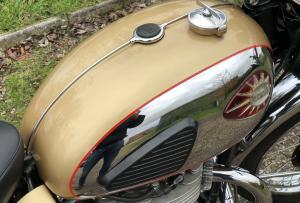 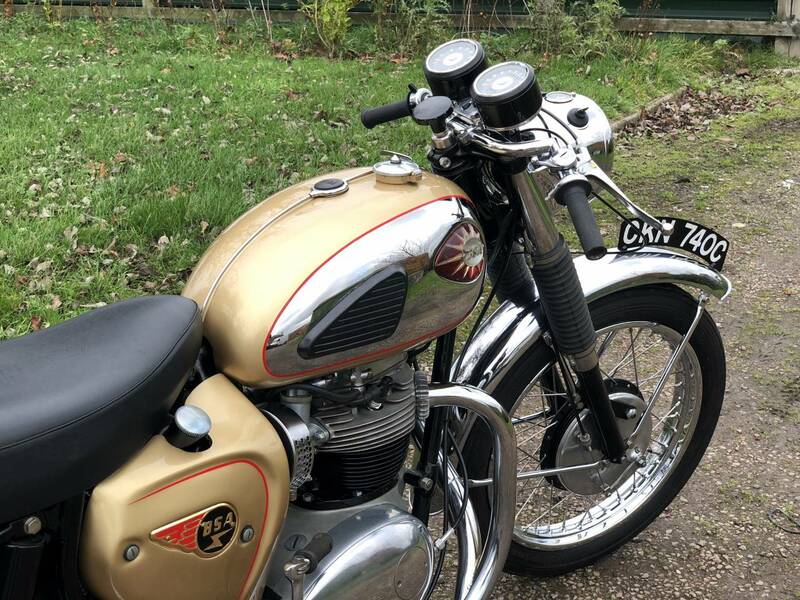 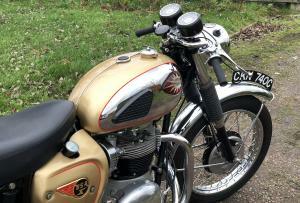 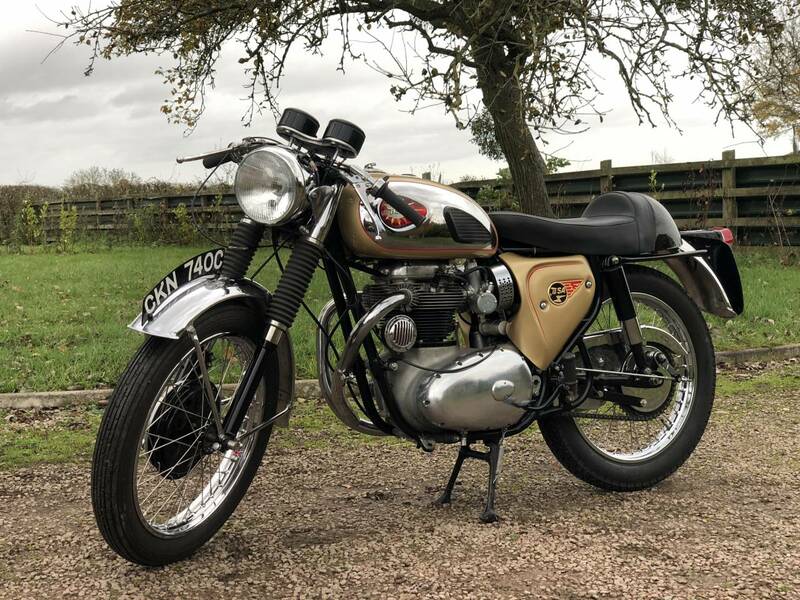 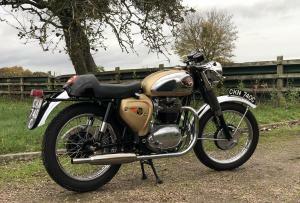 A Fully Restored Example , That Looks To Be All To The Correct Spec , With Close Ratio Gear Box, Unique Long Head Lamp, Special Top Yolk, Drop Handlebars, Rearset Footrests, Cranked kick-start , Special Twin Carburettors , Siamese Two Into One Exhaust System ( with a less restrictive silencer ) Single Seat With Goldie Badge ,Twin Clocks And The Ribbed Front And Rear Goldie Brakes . 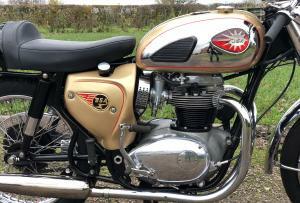 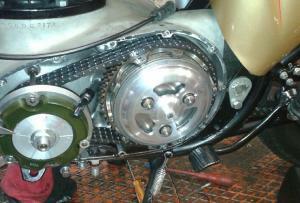 Starts Very Easily , With A Powerful And Smooth Revving Engine . 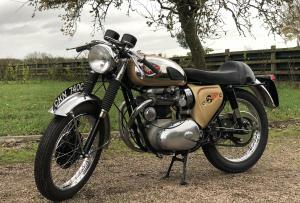 Uk Registered On The 29.03.1965 . 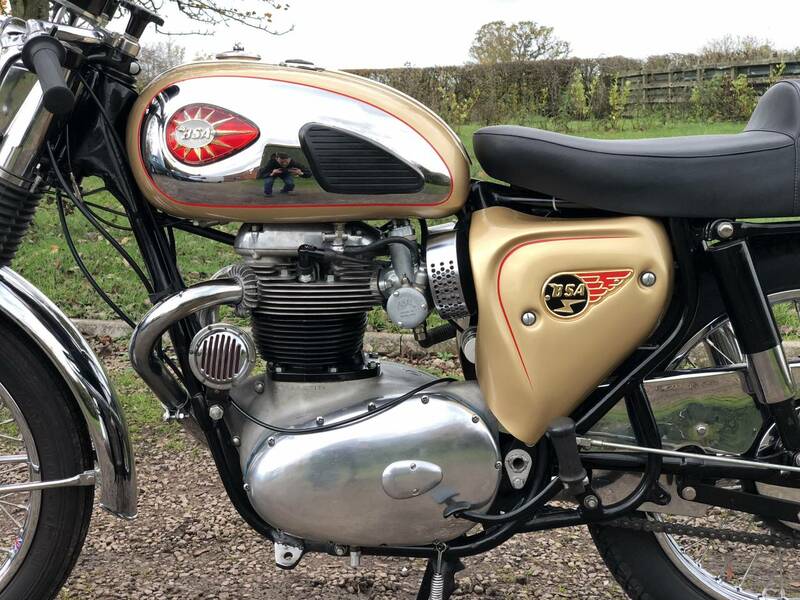 Launched in September 1964 . 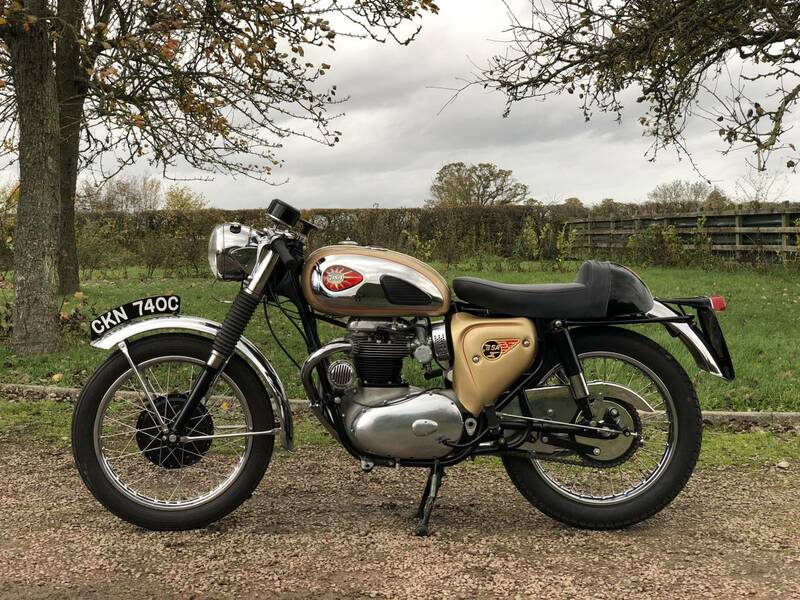 The Lightning Clubman was only in production until October 1965, resulting in a limited production run of 200 machines, so original Clubman models are highly sought after. 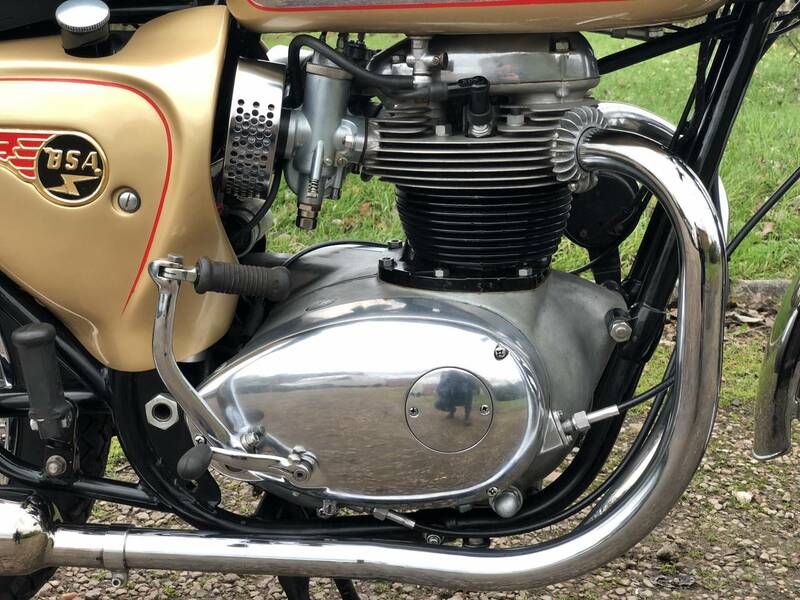 World motorcycle champion Mike Hailwood won the 1965 Hutchinson 100 Production race at the Silverstone racecourse on a BSA Lightning Clubman in heavy rain, beating the Triumph racing team's Bonnevilles. 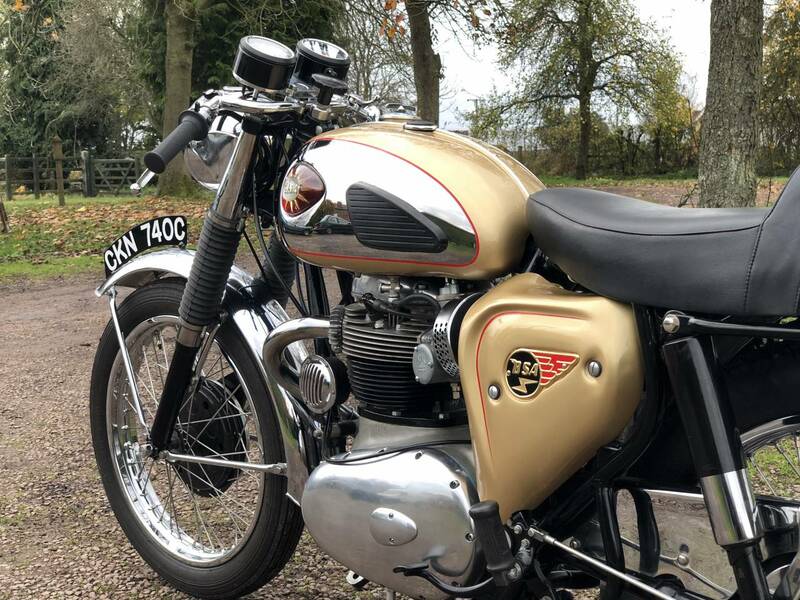 The ' Hutch ‘ was the main production race of the season, so it was very important to manufacturers to establish the racing credentials of their latest range. 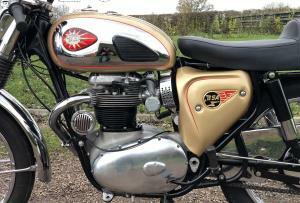 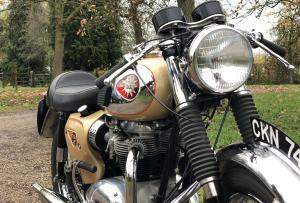 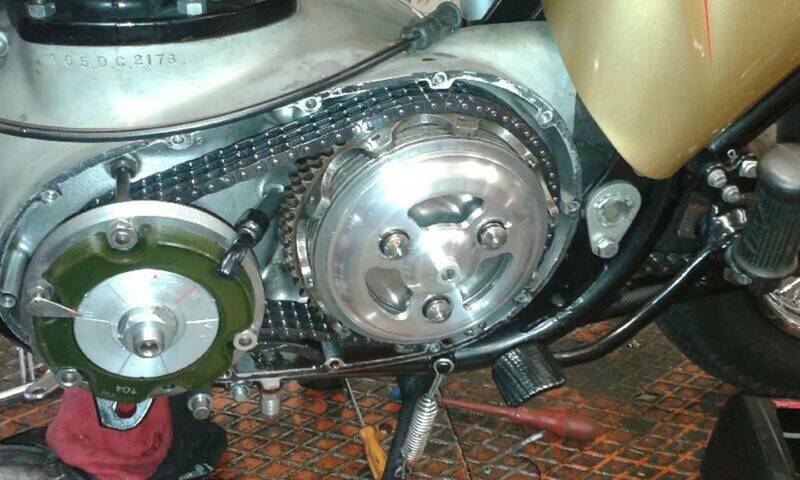 Triumph Bonnevilles were ridden by World Champion Phil Read and Triumph employee/works rider Percy Tait. 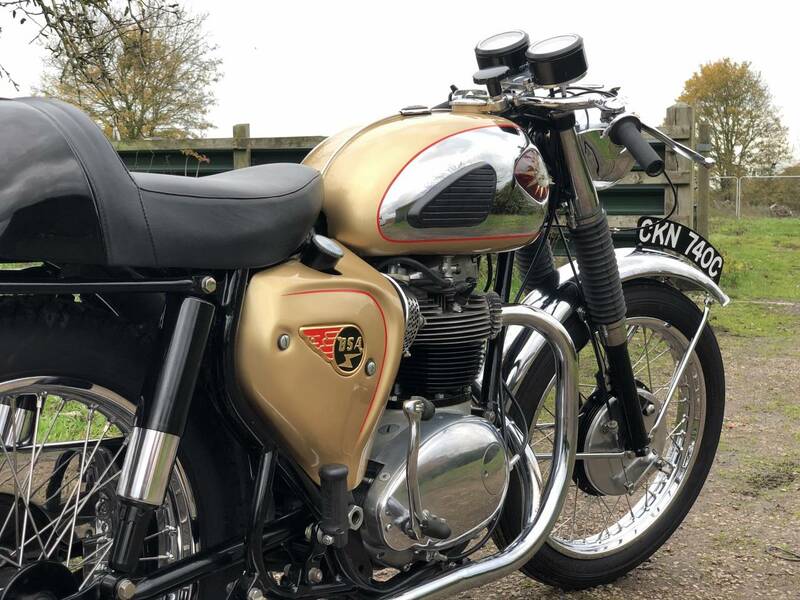 BSA Lightning Clubmans were ridden by Grand Prix champion Hailwood ( with a large number 1 on the fairing ) and factory rider Tony Smith. 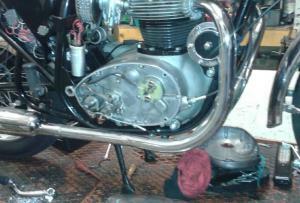 Conditions were poor and Smith was out of the race at slippery Stowe Corner . 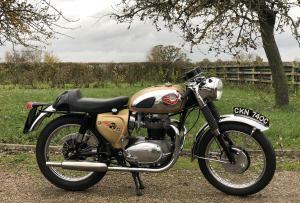 With little regard for the rain Hailwood was achieving laps of 83 mph to establish his winning lead .